As technology and the internet in particular become more and more pervasive in our culture, advertising has been ramping up to meet it. 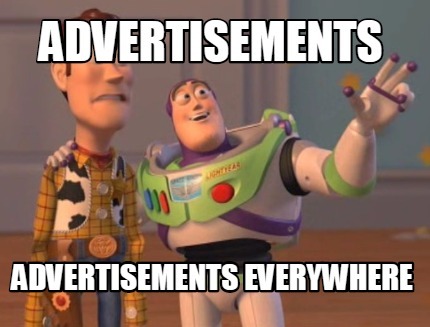 It seems like every website, online video, or mobile app is chock full of ads nowadays. But do they actually work, and how invasive will they get before we’ve had enough? More importantly, are we in the middle of an advertising bubble? If so, what happens when it bursts? Do online advertisements even work? Skip: 15 seconds. Skip: 10 seconds. Skip: 5 seconds. Skip Now. Anyone who uses YouTube is familiar with this sequence. You wait patiently for the button to become active, then you hammer down on it with all the wrath of Thor wielding Mjölnir. If you’re lucky, you don’t crack your screen or break your mouse. But when was the last time you actually didn’t mind the ad, because you were interested in the product being sold to you? For most of us this happens every now and then, but those times are few and far between. Let’s pay specific attention to those occurences. Of all the times you’ve actually been interested in the product being advertised, how many times can you say that you purchased that product as a result of that advertisement? If you’re anything like me, you could easily count the times this has happened on one hand. So not only are we not paying attention to ads, we’re intentionally not paying attention to them. This is bad news for advertisers. However, what’s weird is that it seems like advertising venues like YouTube and Facebook are intentionally avoiding this subject. Of course advertisements work, everyone is doing it! But is there any data to back this up? It doesn’t seem that way. Are we at the height of online advertising? With ads being as pervasive (and sometimes intrusive) as they are now, it’s hard to imagine advertising getting even more ubiquitous. However, what’s not hard to imagine is that companies like Google and Facebook will have to keep pushing advertising. Google has turned advertising into the vast majority of its income, with their profit in this area growing from virtually nothing to $59 billion in the last decade. Facebook hasn’t been doing advertising anywhere near as long as Google, but they’re also now relying heavily on it as a source of income. So what does this mean? It means that the major internet companies in the world have a clear incentive to convince us that advertising works really, really well – even if the data shows otherwise. This also means that they’ll do it even if it means user experience suffers as a result. Since they control the sources of the content we consume, though, and as long as they keep their products free, there’s not much we’re going to be able to do to stop it. Or is there? It’s safe to assume, I think, that most of us would rather live in an advertising free world. But is there anything we can do about it? After all, companies like Google and Facebook control the vast majority of internet traffic, and they don’t have to ask us if we’re okay with advertisements on our products. So what hope do we have of stopping them? Well, luckily, there is a way we can punish them for this behavior. Advertisers don’t have to pay for ads we don’t see. Advertising companies don’t get paid for ads that don’t get displayed. How do we take away the incentive to plaster ads all over everything? We don’t let them show up on anything. 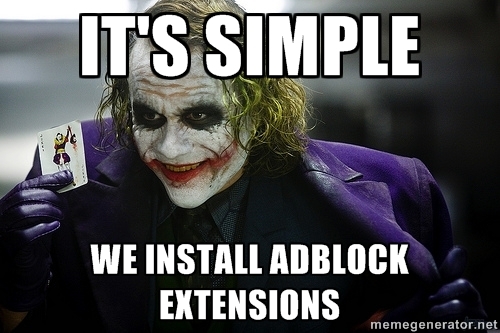 Browser extensions like uBlock and AdBlock Plus allow us to completely ignore advertisements. They de-clutter the internet, and also help us show these companies that we’re not okay with the direction they’ve been taking the internet. What happens when the age of advertising ends? So, what happens if we’re successful, and Google and Facebook and all the other big internet companies stop forcing ads down our throats? Maybe they’ll be forced to make their products valuable enough for us to pay for them. YouTube is already getting ready to do this. Would you pay $5 – $10 per month for YouTube or Facebook if it meant that you never had to see a single ad, and also that those services were improved? Most internet users say yes. Netflix has thrived off of this exact model for over a decade. Maybe the offending companies will die out. Google recently announced that they’re splitting into smaller companies managed under an umbrella corporation, purely for the reason of staying profitable. Maybe the plot of the 2012 movie Branded will come true, and we’ll all move into a golden age of peace and prosperity. Or maybe we just won’t have to look at annoying YouTube commercials anymore. Whatever your reason, we now have the tools to make a difference. We should use them.